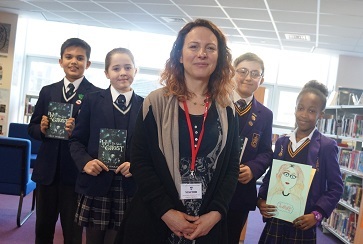 Leeds schoolchildren learned why a story needs a beginning, a middle and an end – especially an end – when they met children’s author Emily Diamand. As an award-winning author, Emily knows all about the structure of a good story. Her first book, Flood Child, won The Times Chicken House Fiction Prize, and she has also written a sequel Flood & Fire and most recently Ways to See a Ghost.